Looking for a bakery-worthy no-bake pie? 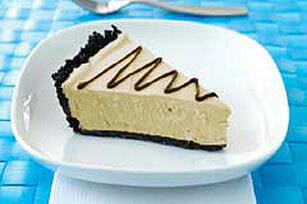 That sounds like our Suisse Mocha Pie, drizzled with melted chocolate. KAHLUA is a trademark of the Kahlua Company used under license. Beat pudding mix, flavored instant coffee and milk in large bowl with whisk 2 min. Stir in COOL WHIP; spoon into crust. Freeze 4 hours or until firm. Melt chocolate as directed on package; drizzle over pie just before serving. Enjoy a serving, 1 slice, of this cool dessert on occasion. After removing pie from freezer, dip pie plate into warm water, just to rim, for 30 sec. for easy serving.